LaptopLcdScreen group of online stores (they have more than 4 stores selling laptops and other digital gadgets) is my old time client. I helped them migrate the websites from one server to another , optimized the server for optimal magento performance and consulted them on various magento functionality extensions. This time they contacted me regarding the need for magento upgrade. They were concerned over security in light of recent magento core code flaws discovered news. They wanted to make sure their online business websites are protected and are running the latest software. 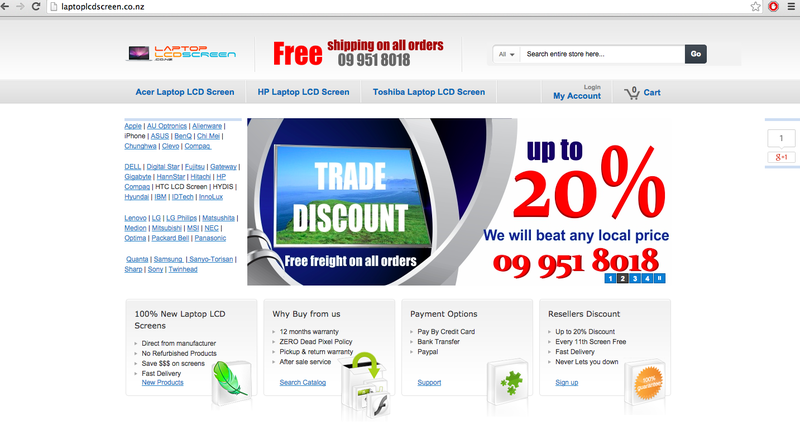 We agreed on price and started out with laptoplcdscreen.co.nz store which was magento community 1.6.0.0. First I set up staging environment where I could perform the test upgrade, fix issues if any as to not interrupt the live sales. I always do that A. to allow enough time to fix upgrade related problems that might come up B. to allow client himself test the updated website functionality and confirm It works ok C. to lower the live website downtime since once I make everything working on dev website I could quickly and easily repeat the procedure on production environment. After stage website was upgraded the client reported issues with custom search functionality not working, he also was unable to login to customer area and the checkout was not working at all. I fixed custom search by editing the custom extension code to reflect recent magento changes. In some cases I prefer to fix 3rd party extension myself in other case I ask client to contact vendor for plugin upgrades. Since the client was using custom theme I fixed other issues reported by patching the phtml and layout files to incorporate new magento frontend changes. Those were tested and confirmed by the customer and we were ready for push changes live. Magento upgrade on production went without any problems since as I mentioned earlier I was able to fix issue on staging enviroment. That procedure stage first - live second proved right once again. If you would like to upgrade your magento website as well - contact me today!